Register now for the Spring 2019 IP Networking course here. Just $299 for the course. If you have IT networking expertise / knowledge (e.g., have or could pass the CCNA or Network+ certifications), you should not take this course. The better course for you is our IP camera course (next being held in October 2019). 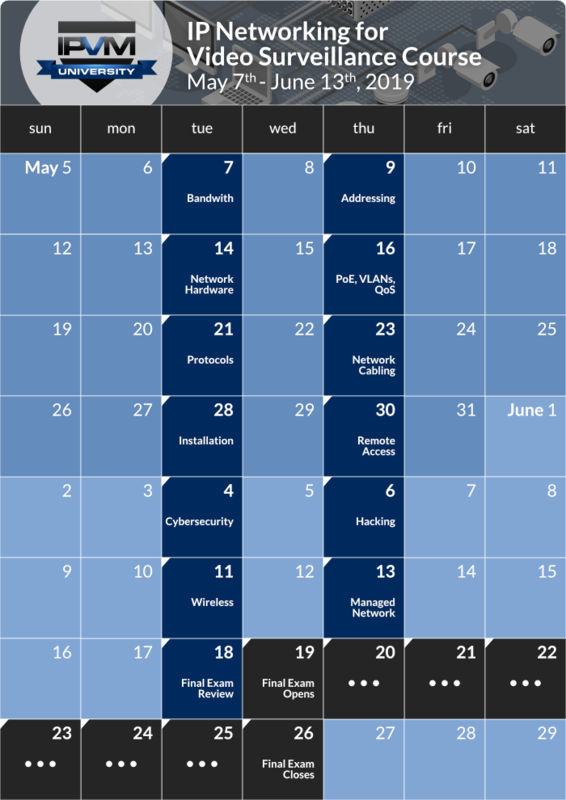 The IP Networking course will meet live online, starting May 7th for 12 times over 6 weeks (Tuesday and Thursday), and will meet at 1:00 pm EST / 18:00 pm UTC. Additionally, all classes are recorded so you can watch on-demand online anytime. At the end of the classes, you will take a comprehensive final exam including multiple choice and essay questions. If you pass, you will become IPMVU IP Networking certified (see list of IPVM Certified Professionals). The course price is $299 USD, including live classes, recorded classes, private class discussion group, personal help, examination, and certification, if you pass.